Cardiac Arrest is a British medical drama series made by World Productions for BBC1 and first broadcast between 1994 and 1996. 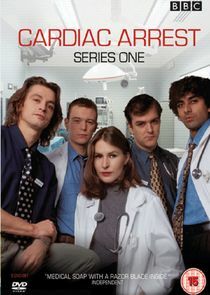 The series was controversial due to its cynical depiction of doctors, nurses, and the National Health Service, although it has often topped polls of the UK medical profession as the most realistic medical drama of all time. The series was created by Jed Mercurio (writing under the pseudonym John MacUre), a former junior doctor who had worked at a hospital in Wolverhampton, who drew on his own personal experiences to provide a more visceral, albeit wryly humorous, look at the NHS in the 1990s. Cardiac Arrest is a satirical comedy drama that follows the journey of Dr. Andrew Collin, a newly qualified houseman who arrives on the wards equipped only with theoretical knowledge and a sense of humour. Collin's idealism is immediately at odds with senior house officer Claire Maitland, a pragmatic and cynical physician determined to make him learn the hard way.